Although the word "rhododendron" in Greek means rose, the plant would be difficult to confuse with the rose bush. There are more than 1,000 species of rhododendron known in the world. Most of these are shrubby plants with clusters of flowers at the tip of each plant spike, the most well known being azalea shrubs. Rhododendrons range from tree sized plants to tiny shrubs. Each species of rhododendron requires specific care. To properly care for your rhododendron, you must first identify it. Pick a leaf from a rhododendron and examine it. Each species of rhododendron has a different leaf shape, coloring, texture and size. For example, rhododendron aberconway has heavy textured, elliptical leaves that are 2.5 inches long, while rhododendron oldhamii has ovate leaves that it sheds in spring that are 3 inches long. Oldhamii's summer leaves are only 3/4 of an inch long. Examine the blossoms of your rhododendron. Rhododendron flowers vary in color and size, as well as the number of blooms in a cluster. While rhododendron galactinum has white or pink blossoms that grow in clusters of about nine blossoms, rhododendron Capistrano has yellow blossoms in clusters of 15. Measure the height of your rhododendron shrub. Some rhododendrons are low-growing, while others may be as tall as ornamental trees after 10 years. The hybrid rhododendron dichroanthum ssp. apodectum will only reach 3 feet high after 10 years, while rhododendron maximum may grow up to 5 feet. Photograph the plant with a digital camera so that you can use the photos for comparison against known rhododendron species. 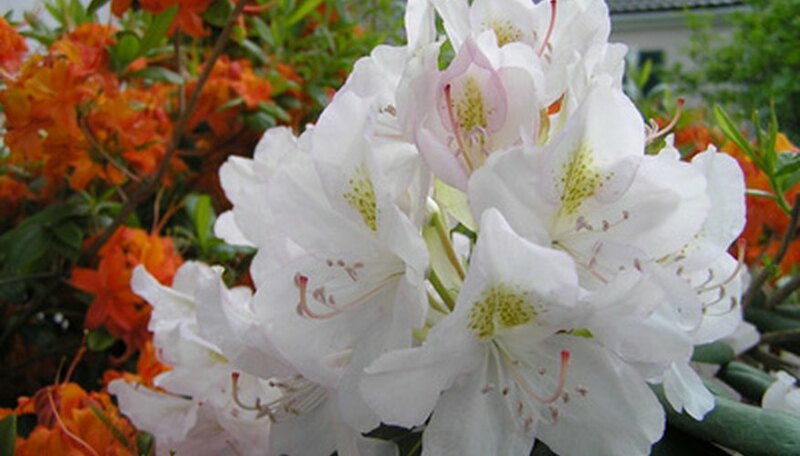 Consult rhododendron enthusiasts such as the American Rhododendron Society. The society maintains and extensive list of heirloom and hybrid rhododendrons, as well as photos of each species and their characteristics, in online databases. Using these databases, you can narrow down your list of possible rhododendron plants until you have a positive identification.